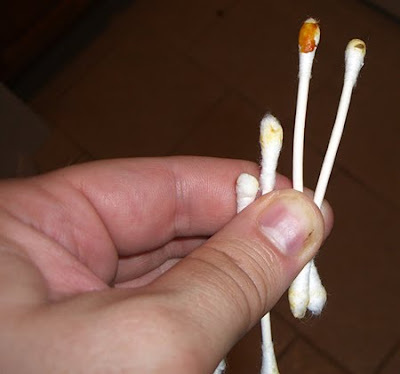 Ill With The Composition: Ill Esoterics: "An Earful"
A few weeks ago, I pulled a pea-sized gob of black earwax from my left ear, got curious, and wanted to know more. It was one of those situations where I always assumed that my experience was similar to that of others because we don't talk about earwax in polite company. After I found out that earwax, known scientifically as cerumen, comes in different varieties, I decided to follow up with friends and co-workers. According to several sources, including this fascinating article on Japanese ear-picking salons, "wet earwax is most common in those of European and African descent, while East Asians have dry, powdery earwax." While hardly a statistically valid sample, amongst those I asked, the two European (Italian and Slavic) and one African descendant had dry, flaky earwax, while the East Asian's was "golden and waxy." One woman I interviewed claimed not to have earwax, which sounds like a way to distinguish human from alien or cyborg. My doctor friend (the golden and waxy East Asian) couldn't recall learning anything about cerumen in med school, but from his personal experience had seen it vary from "flaky and white to dark brown and caked." He also pointed out that race would be a factor in the appearance because some of the wax is sloughed skin, so the skin pigment contributes, at least to the color of the wax. The wax is produced in the outer third of the canal, and the motion of the jaw while chewing shifts the wax gradually outward, containing dust or debris that has entered the canal, and pushing it outward. The use of blunt objects to clean the ear, without the use of a scope, could push the cerumen further into the canal, impacting or blocking the ear drum. Not only is earwax migratory, but because earwax type is genetic, earwax can be used as a genetic marker to determine the relationship between migratory peoples. Before you get the idea that this trend emerged with the rich, ear cleaning is an Asian tradition, originally performed by a wife for her husband, then outsourced to street-side "professionals" before making a clinical leap. There are even reports of a club in Tokyo where a man can get two female otolaryngologists to clean his canals simultaneously. Okay, I made that up. I think.